What Is Collective Intelligence And Why Should You Use It? Defined by MIT Sloan School of Management Professor Thomas Malone, collective intelligence occurs when groups of individuals act collectively in ways that seem intelligent. In today’s workplace, where artificial intelligence is becoming increasingly prominent, a new type of collective intelligence has emerged – one where interconnected groups of people and computers work alongside each other to produce desirable results. According to Malone, in his book The Future of Work, the company of the future will look very different from the tight-rein, centralized management approach of today. 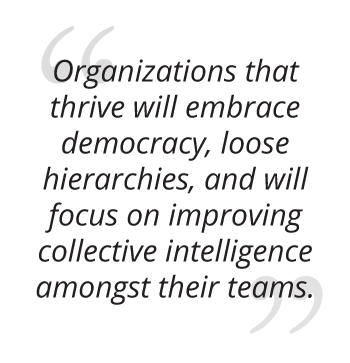 Organizations that thrive will embrace democracy, loose hierarchies, and will focus on improving collective intelligence amongst their teams. Business leaders should be encouraged to embrace rather than reject the human-machine relationship, and can benefit from learning how to champion the strategic integration of AI into their organization. A great example of an organization’s ability to harness collective intelligence through humans and computers dates back to the start of the millennium, when NASA asked amateurs to help map the surface of Mars. An experimental project called Clickworkers was set up and, after a short tutorial, participants surveyed photos of Mars in order to identify and catalogue craters on the planet. The result? The collective virtual inputs of these participants were almost indistinguishable from the conclusions drawn up by a geologist with years of experience in identifying Mars’ craters. This crowdsourced analysis allowed scientists to save time by avoiding months of routine work. While the human-computer relationship traditionally required input from humans into computers, we’re reaching a stage where AI no longer requires this information. Take the overnight – and apparently independent – improvement of Google Translate as an example, or the recent report from Google that AutoML outdid Google’s own AI experts when it coded itself to recognize images like a human does. AutoML scored almost 20% better than any human-built system. Artificial intelligence is starting to harness its own collective intelligence, it seems. How can I harness collective intelligence (and artificial intelligence) in my organization? Secondly, be willing to embrace and work alongside artificial intelligence technologies in order to benefit from the way they can enable collective intelligence. Louis Rosenberg, CEO of Unanimous A.I. backs this sentiment. He believes if there are ways for companies to make smarter decisions, it’s worth understanding them and exploring if new technologies can help us implement such methods. Rather than taking the place of leadership, decentralization and collective intelligence offer an opportunity to shift the way we think about leadership and lead to a new way of working – one where we’re able to integrate of AI technology into a business knowing it doesn’t pose a threat, but rather an opportunity to enhance and empower the way teams collectively do intelligent things for the benefit of an organization. Thomas Malone is a Professor of Information Technology and of Organizational Studies at the MIT Sloan School of Management, and his research focuses on how new organizations can be designed to take advantage of the possibilities provided by information technology. He has published his groundbreaking research in the book The Future of Work and in over 100 articles, research papers, and book chapters. 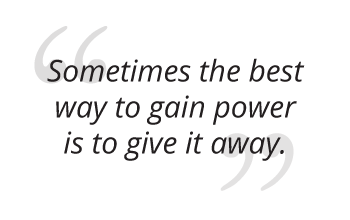 He holds 11 patents, cofounded three software companies, and is quoted in numerous publications such as Fortune, The New York Times, and Wired. He is also co-Faculty Director of the MIT Artificial Intelligence: Implications for Business Strategy program, where he has guided program design and will share his experience and in-depth subject knowledge through a number of course videos. Understand the reality of central AI technologies today and how they can be harnessed to support your business needs.